Everything you need to know about the Weber State Wildcats before the 2016 NCAA tourament begins. The Case For: The school that gave us Harold "The Show" Arceneaux and Damian Lillard may have found another star in Bolomboy, a 6'9" senior who averaged a double-double for the second straight year and ranked third in the nation in rebounds per game. While he could follow Lillard's path from Ogden, Utah, to the NBA—he is considered a back-end second-round pick by some outlets—Bolomboy first gets the chance to replicate the performance of Arceneaux, who scored 36 points in a first-round upset of No. 3 seed North Carolina back in 1999. Junior guard Jeremy Seglin gives Weber State a strong outside-inside combination, as he averages 18.2 points per game and shoots better than 40% from three-point range. In all, nine players average at least 17 minutes per game, so the Wildcats should have the depth to hang with anyone in the field. 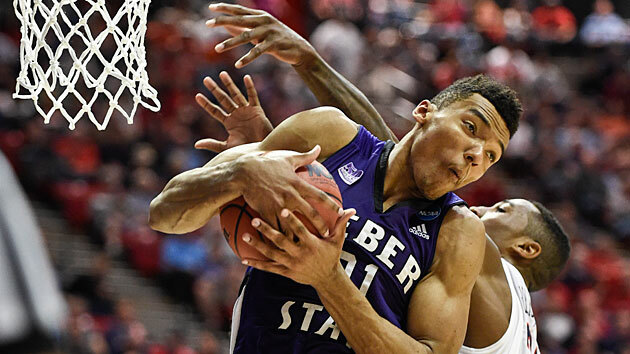 Defensively, Weber State does an excellent job stifling its opponents' both on the perimeter (seventh nationally in attempted three-pointers against) and on the glass (securing roughly 75% of all available defensive rebounds). The Case Against: Bolomboy and Seglin are the team's only two players who average at least nine points per game. If they are having an off-game, or if they can be slowed down, the Wildcats will be in trouble. And while their metrics are impressive, the quality of their competition has not been. South Dakota State, the No. 12 seed in the South region, is the only fellow tournament team they've faced all year, and Weber State split its two games with the Jackrabbits. Despite the presence of Bolomboy, the Wildcats will still be heavy underdogs in this tournament.